As it was on this day, 19 May, in 1882 that Commodore Shufeldt landed in Korea from the USS Swatara, and as the Swatara has some connections to Australia, I thought I’d mention her here. The ship is also quite interesting as she started life as a wooden, screw sloop in the United States Navy. She was named for Swatara Creek in Pennsylvania and was launched on 23 May 1865 by the Philadelphia Navy Yard; sponsored by Miss Esther Johnson; and commissioned on 15 November 1865, Commander William A. Jeffers in command. The details of the vessel are in the table below, comparing her to the rebuilt Swatara. The first Swatara served with the US European Squadron until 1869, then serving in the Atlantic Squadron until 1871. 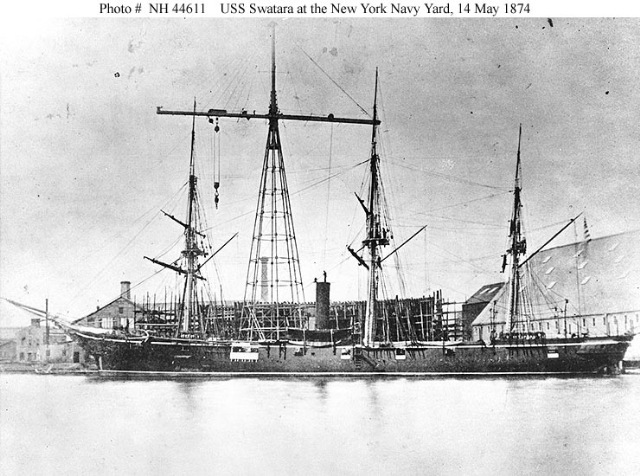 In 1872, as part of the Secretary of the Navy George M. Robeson’s plans to overhaul and modernize ships of the Navy, the first Swatara was taken to the New York Navy Yard, ostensibly for “repairs.” In fact, the “repairs” constituted construction of a new ship, for Swatara was given a new hull and unused machinery which had been in storage since 1865. Embodying only certain fittings and equipment from the first ship, the second Swatara was launched on 17 September 1873 at the New York Navy Yard and commissioned on 11 May 1874, Capt. Ralph Chandler in command. The Swatara transported five scientific parties to the South Pacific in 1874 to observe the transit of Venus. The first team landed at Hobart, Tasmania, on 1 October 1874 and then Kerguelen Island; Queenstown, Tasmania; New Zealand; and Chatham Island. She returned all but one of the parties, picked up by Monongahela ((USS Monongahela (1862) was a barquentine–rigged screw sloop-of-war that served in the Union Navy during the American Civil War finally being paid-off in 1908))(shown to the left), to Melbourne early in 1875 and then sailed back to the US where she joined the Atlantic Squadron again for a time and was then retired for a while. Swatara was recommissioned on 24 December 1879 at Boston Navy Yard and departed on 21 January 1880 for the Far East. She visited numerous Mediterranean ports and transited the Suez Canal, eventually arriving at Hong Kong on 17 April 1880. Swatara called at many east Asian ports during her Asiatic Squadron duty, including long stays at Shanghai, Chefoo, and Yokohama. Departing from Yokohama on 7 July 1882, Swatara headed for home waters, via the Cape of Good Hope, and arrived at Hampton Roads on 4 December 1882 for an overhaul. 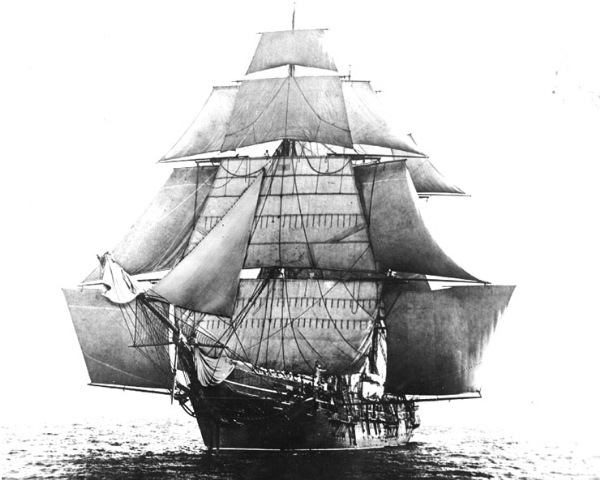 She was eventually struck from the Navy list on 29 July 1896 and sold at public auction on 2 November. Her connection with Korea, however, was in 1882. The tale of this involvement goes back to 1866 when the US was attempting to spread its influence through the Pacific chasing trade amongst other things. Commodore Matthew C Perry had forced a trade treaty on Japan in a wonderful example of gunboat diplomacy. In 1866 however, the American schooner Surprise foundered in the Yellow Sea (East Sea) off Korea’s Coast and the crew abandoned ship and rowed to shore. The Korean authorities picked them up and returned them across the Yalu River and into Manchuria, being delivered to the American consul at Yingtsze on Liaotung Bay. They were returned from there to the US. Meanwhile, at much the same time, the American schooner General Sherman was under charter to a British firm and sailed from Chefoo in China to Korea. This was supposed to be a trade cruise. The General Sherman sailed up the Taedong River toward Pyongyang and got stuck on a mud bank when the water lever dropped quickly. She remained stuck fast there. It seems that orders came from Seoul to clear out the problem so the Koreans attacked the vessel. The crew held out for four days until finally being overwhelmed. The ship was burnt. In January 1867, curious to find out what had happened to the General Sherman, Robert W Shufeldt commanding ordered the USS Wachusett to Korea to find out what had happened. Bad weather forced the Wachusett before being able to receive a response from the Korean king about the General Sherman. In spring of 1868, John C Febiger in command of the USS Shenandoah sailed to the mouth of the Taedong and made inquiries as to the General Sherman and her crew. He was told that a mob had destroyed the vessel and killed the crew after it had been intimidated. Febinger returned to the US. In 1870, Frederick Low, who was the US minister to China was instructed by the US Secretary of State, Hamilton Fish, to secure a treaty from the Koreans for the protection of shipwrecked sailors. He was also told to secure an commercial treaty. Low sailed aboard the USS Colorado and along with a squadron of warships and gunboats, set sail for Korea from Nagasaki. They arrived at Chemulpo and contacted Korean officials. On 1 June 1870, four steam launches traversed the Yom-ha (Salée River) to make soundings near the island of Kanghwa at the mouth of the Han River. The Korean shore batteries opened fire and there was a short fire fight. One year later, on 1 June 1871, Low ordered an attack on the Korean fortifications along the Yom-ha. This happened, the fortifications were destroyed and around 250 Koreans were killed in the process (3 Americans were also killed). The Americans, however, still did not get their trade treaty and left. In 1876 a flotilla of Japanese warships sailed menacingly along the west coast of Korea and extracted the Treaty of Kanghwa from the Koreans, allowing unrestricted business and trade between the two nations. 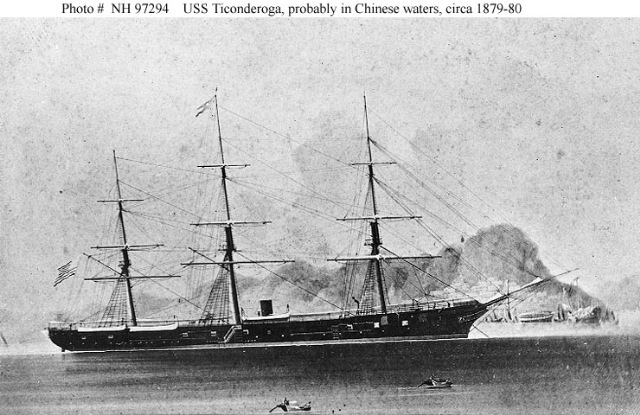 In 1878, the now Commodore Robert Shufeldt left Norfolk in the USS Ticonderoga (pictured to the right in Chinese waters on this trip) with a fleet of American warships undertaking a round the world tour – sort of a precursor of the Great White Fleet. The objective of this fleet was the expansion of US trade. When he got to the east, he used the assistance of Japan to try and negotiate a commercial treaty with Korea (the fleet of warships may also have been of assistance). In 1880, however, the Chinese (the suzerains of Korea at that time) invited Shufeldt to Peking and discussions led to a treaty. Shufeldt eventually sailed from China to Korea aboard the USS Swatara in 1882 and on a hillside near Chemulpo a treaty of amity, commerce, peace and navigation was signed. That then is the tenuous connection between the Swatara, Korea and Australia.